Ford’s C-MAX is hitting an early high note with consumers. The hybrid and plug-in hybrid version builds on the versatility of this car. The Ford C-MAX Hybrid has done well so far, it even outsold Toyota’s Prius v in its first full sales month by 3,182 units for Ford compared to 2,769. Not only is this Ford’s strongest October small car sales in 11 years but it becomes a 54% increase year over year. What picked my curiosity was that nearly 70% of C-MAX Hybrid buyers are new to Ford, and with a whooping 25% of sales in California. America’s Most Fuel-Efficient Hybrid Utility Vehicle. 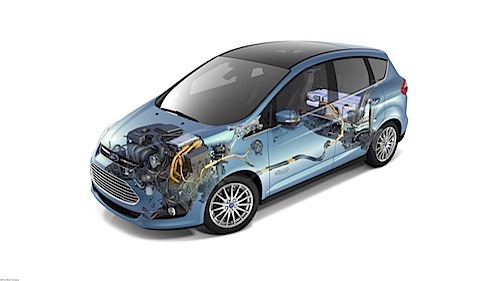 Dubbed as “America’s most fuel-efficient and affordable hybrid utility vehicle” according to Ford, the C-MAX has become one of the company’s best-selling car meeting a frank success with its new owners. The new C-MAX Hybrid gave Ford’s best October hybrid sales month ever with a total of 4,612 sales, up 142% over October 2011. The C-MAX Hybrid was the leading reason, while the sales of the Focus, and Fiesta helped boost the total sales. California And Trade Ins. California boost Ford’s sales with one in four C-MAX Hybrids sold there for the month of October. The other noteworthy numbers show more than 70% of C-MAX Hybrid buyers traded in a competitive model or added it without trading in another vehicle. One third of C-MAX Hybrid customers in October said they cross-shopped the Toyota Prius and Prius v before. While Waiting For Ford’s First Plug-In Hybrid. The C-MAX Energi is now available at Ford EV-certified dealers in half the states across the country. It will be interesting to gauge the success of Ford’s first production plug-in hybrid that is estimated delivering 108 MPGe city EPA rating. According to a Pike Research report, Ford’s electrified vehicle strategy is on the right track to join Toyota as leaders in electric vehicle sales by 2020. The report projects plug-in hybrid sales will reach nearly 48,000 units in 2012, and sell faster than the early days of conventional hybrids by later this decade. Ford Triples Dealers Certified. In order to meet the demand for its C-MAX Energi Plug-in Hybrid, Ford has tripled to more than 200 the number of dealers certified to sell its new plug-in electrified vehicles, the C-MAX and Fusion Energi. With more than 900 dealers either certified or enrolled for certification, the company plans certified dealers in all 50 states by early 2013 in order to accommodate the new Fusion Energi plug-in hybrid. Is Ford out there with a strong drive or what? (Pun intended) It’s interesting to see how Ford is taking on Toyota, which shows how far the company has come in the middle of the world’s greatest economic downturn. There was a time when we compared Ford to GM and Chrysler, but Ford doesn’t even mention its local competitors anymore. The Ford C-MAX does strike the right dimensions between an SUV, a cross-over and a minivan, appealing to all these segments. In one month this green car's sales have surpassed all of the Fiskers and Teslas that have been delivered to customers - ever. Interesting.